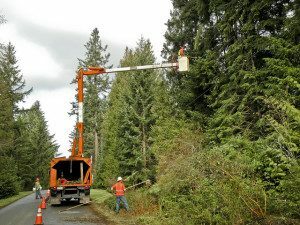 Lewis Tree Service has more than 20 years of experience managing all aspects of tree and yard care. We are a family run business that operates in three counties in the Bay area: Santa Cruz and Monterey. Our staff includes certified arborists to provide expert assessments and recommendations, as well as to answer any questions you may have about vegetation management, weed control, and fire prevention. Standard methods of vegetation management include things like mowing, trimming, and weeding–all important aspects of landscape management, but all are temporary fixes to a long-term problem. A comprehensive vegetation management plan addresses the root of the issue and prevents the further growth and propagation of invasive and unwanted plants. While fire safety is one of the primary reasons to have a vegetation management plan in place, there are several other benefits to regularly addressing overgrown brush and weeds. (Click here to learn more about fire safety and vegetation for property owners.) These benefits include early detection of tree and yard health issues, a streamlined and easy to manage plan for addressing issues that do arise, and a cleaner, safer, and more beautiful property. Call us today at (831) 508-8995 if you need vegetation management services or have questions! Our staff of experts are happy to answer questions, offer advice, and extend a FREE cost estimate to all interested parties!